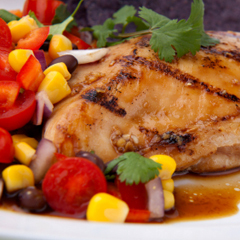 Cumin Chicken over black beans | Relish! Give your chicken a Southwestern twist with cumin, beans, and bell peppers. Place the chicken breasts between 2 sheets of plastic wrap and, using a meat mallet, pound to a 1/2-inch thickness. Combine the cumin with cayenne pepper and rub over the chicken. Heat the oil in a large skillet over medium heat and sauté the chicken for 4 minutes per side or until cooked through. Remove to a cutting board. Cut into strips when cool. Place the skillet and the pan drippings back on the burner over medium heat. Add the onion and jalapeño and sauté for a minute. Add the beans, corn, tomato, cilantro, vinegar and water. Cook until the beans are heated through, about 5 minutes. To serve, place the beans on the plate and top with chicken strips. Garnish with extra cilantro and serve. Note: Always use gloves when chopping peppers!